WE WILL UPDATE THIS ARTICLE WITH THE LATEST INFORMATION AS IT ARISES. – As you may have read on various platforms the future of the Intimate Theatre and Cannon House are currently unclear as there are plans to sell Cannon House and demolish and redevelop the Intimate Theatre. Confirmed on the 2nd September. – We met with Father Mehall and two of the Buildings Audit committee from the Parish on the 12th September and were joined by representatives of Acorn Theatre Company and The London Pantomimers who also use the Intimate. – Sadly at this meeting we were told that after a five year review the plans were final, all possibilities had been looked into and any suggestions we had would not be considered. – SMP is opposed to this redevelopment as we stand to lose both a theatre that we perform in, rehearsal space and also our storage facilities for set and costumes. – We believe that with refurbishment and proper management of The Intimate it could be a successful theatre and a space for the parish to use. – There have been rumours for some time about the potential redevelopment of the Intimate Theatre site. 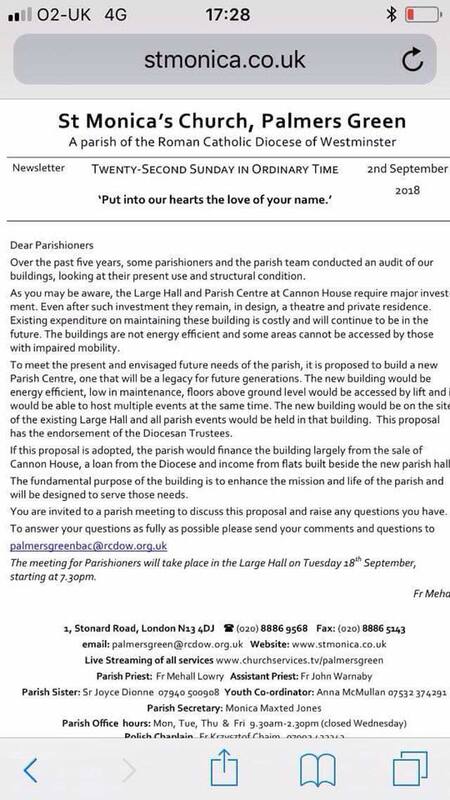 – At a meeting held on the 18th September for parishioners, and some of the users of the Intimate Theatre, a presentation was given regarding the current state of buildings and three options that the church had considered. 2. Sale of Cannon House, demolition of The Intimate Theatre and new build of parish centre. 3. Sale of Cannon House, demolition of The Intimate Theatre and new build of parish centre. Addition of 6 flats. – The Buildings Audit Committee of the church decided that for the project to be financially viable, option three was the best option as flats were needed to help finance the project. – During the meeting questions were taken and we were told the architect would take everyone’s points into consideration. – The church has also reached out on social media placing the following statement on the Love Your Doorstep group. – It’s unclear from both if the flats are no longer being considered as part of the build as they are not mentioned in either statement. But this seems unlikely as we were told they were vital to help finance the project. 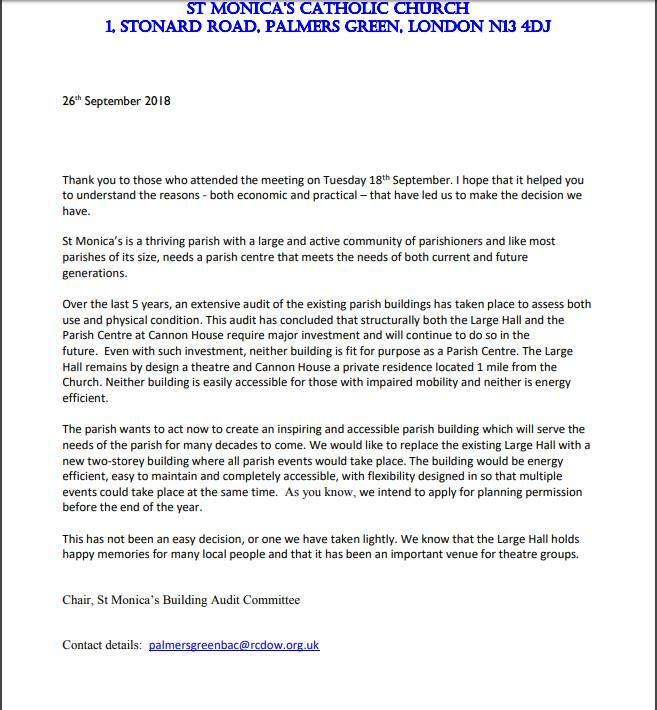 Update – at the meeting on the 1st of October a question was asked if the construction of flats had been mistakenly left off these statements and it was confirmed by Father Mehall it must have been a mistake. The delay in publication of the Parish Newsletter was also raised as there had been a regular update in the past. This would be looked into. – There will be a further meeting the 1 October at the Intimate Theatre 7.30pm where the church will show its plans for the new development. We will then have a better understanding of what they intend to replace the theatre. – We have accepted their offer and the date for the meeting is TBC. – As it stands our production of Snow White and the Seven Dwarfs in Jan 2019 could be the final show staged at the Intimate Theatre. – On the 1st of October a second meeting was held by Colin Smart of Kyle Smart Associates, the architect appointed by St Monica’s, to show the original concept ideas to the parish. A short introduction was given by Father Mehall and by Paolo Camoletto (Diocesan Chief Operating Officer). – The new parish centre contained a café bar/foyer, a large hall which could be split with a dividing acoustic screen, a new kitchen, a breakout area upstairs and some meeting rooms and offices on a second level above the main entrance. The plans also contained a 3 storey block of flats at the rear of the new development which would run along the current line of housing on Stonard Road. – Questions were raised including some on the financial aspects of the project but as this was a concept meeting and those areas would be addressed later. A question was asked about parking for the flats, it was confirmed the flats will have no additional parking. 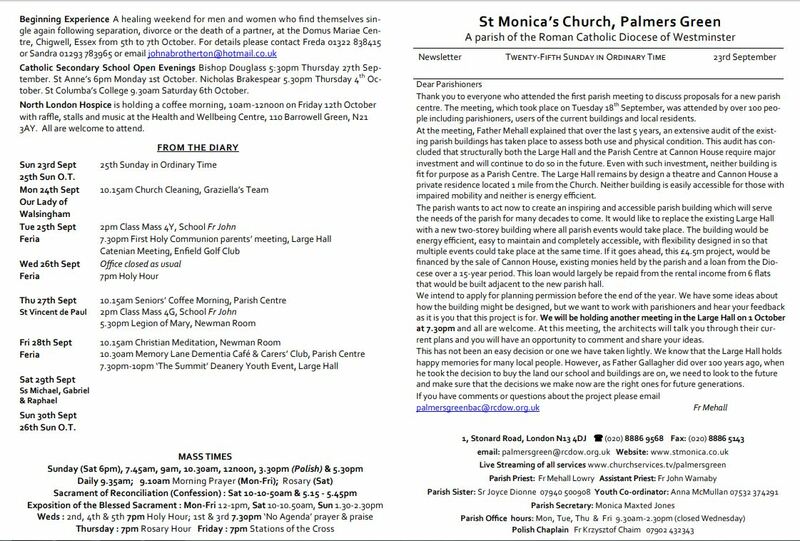 – On the 3rd of October the latest parish newsletters were published online. The 23rd September edition carried a statement that was similar to those already published online but now included mention of the construction flats. – On the 25th Of October we were informed that as planning had not yet been submitted and this pocess would take some time we would be able to book Cannon House until Easter 2019. We asked if that extended to the Theatre as we are keen to put on one more production there if possible to give the venue a fitting send off. We have been told that there will be no bookings in the Theatre after our Pantomie in January 2019. However as we are keen to make sure the Theatre still gets used, and does not sit empty, we have asked the BAC to reconsider and if we could still rehearse on a Monday and potentially put on a show in Easter. – On the 11th December 2018 the Theatre was listed as an Assest of Community Value. The Intimate Theatre Facebook page announce the decision for it to be granted. 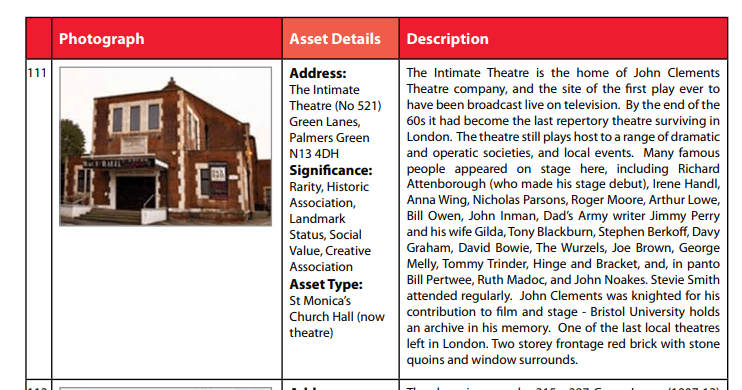 We’re pleased to announce that The Intimate Theatre is now listed as an Asset of Community Value by Enfield Council. This follows a succesful application supported by six local amateur dramatic groups on behalf of the wider community that use the Intimate for various uses. The application was granted despite a challenge from St Monica’s Parish. Thank you to all that have signed the petition, it did not go unnoticed by the panel. 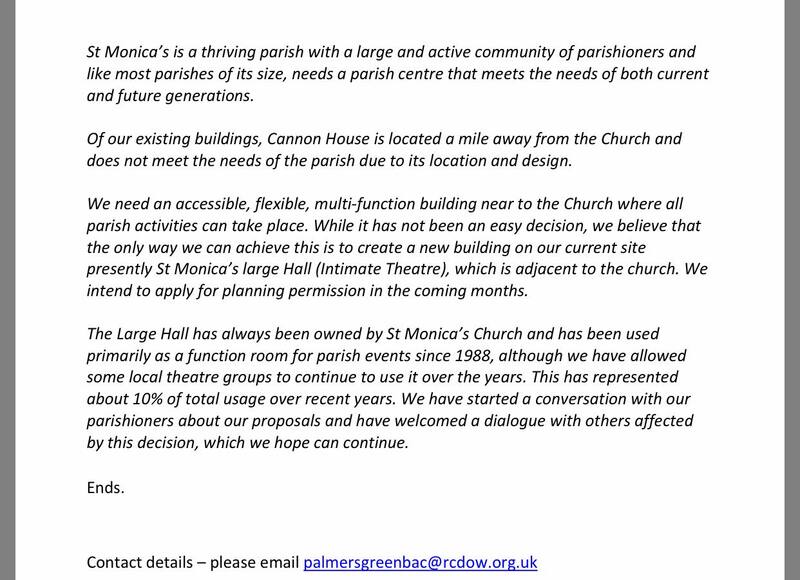 – On The 1st February St Monica’s Church put out a press release with an update on their plans. We felt some of the information included warranted a response and so on the 4th of February we issued our own press release. You can read both below. – As a group we are opposed to the sale of Cannon House and demolition of the Intimate Theatre. – We stand to lose both our rehearsal venues, the venue to perform our annual pantomime and our storage space for set and costumes. – We believe that by refurbishing and developing the current buildings and with good management the needs of the parish groups could be met and prioritised, avoiding demolition of such a valuable asset to the community. – There are people willing to volunteer to help with management of the building and with the refurbishment process. But it would take the will of the church to allow that to happen. – With some good lighting and a bit of creativity we know how nice the venue can look these pictures are from a wedding reception in the Theatre in 2013. Should planning be granted we would like to produce on last show at the Intimate to give it a fitting send off. We have asked about a booking in Easter 2019 but have been told that there will be no bookings allowed after our panto in Jan 2018. What this means for Saint Monica’s Players. – Despite our name we are designated as a non-parish group. As a non-parish group we were not included in the 5 year consultation nor were our needs given any priority. – In addition, our members have helped by serving on committees and assisting at fundraisers like the Cannon House garden parties where we have provided equipment, organisation and entertainment to help raise money for the parish. Members have also played Father Christmas for the parish children in the past. 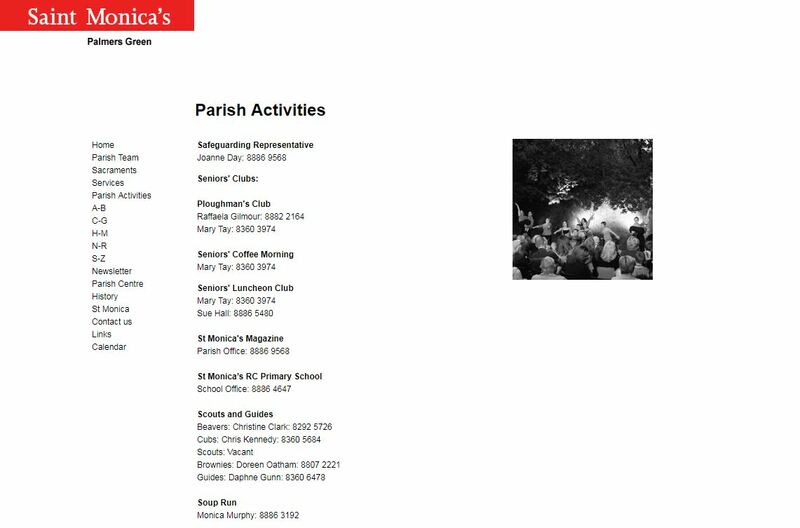 – We believe that we were included on the St Monica’s Parish website under parish activities S-Z. Currently our contact details are not listed but a picture from our show ‘Some Enchanted Evening’ performed at Cannon House in 2006 appears. What do we plan going forward? – We are actively in the process of looking for new rehearsal venues, and either somewhere to store our costumes or a site that we could place a portacabin/shed. If anyone has any suggestions please get in touch. – Our summer musical has not been confirmed. We were looking into the possibility of a musical as normal as well as a full length Shakespeare play staged outdoors in promenade at a location in Enfield. – Due to the uncertainty we may not be in a position to put together a musical for summer 2019. – However we will be performing the full length Shakespeare play and are committed to performing a pantomime in 2020. – As of 3/02/19 – We will be performing a promenade performance of Much Ado About Nothing in Bury Lodge Park in June and we will be part of Waltham Forest’s London Borough of Culture programme as we will perform Cinderella at the Chingford Assembly Hall in December 2019. Why is the Intimate Theatre important? – The Intimate was built by the church in 1931 for parish use and became a professional theatre in 1935, when it was home to Sir John Clements’ repertory theatre company. – It was the first London theatre to reopen during WW2 and the theatre made history when George and Margaret, a comedy by Gerald Savory, became the first play to be televised on the BBC in 1946. – Since then many stars, including Richard Attenborough, Roger Moore and David Bowie, have graced its stage. – It is now one of the last remaining local theatres left in London and its sprung floor and plaster proscenium arch are rare examples of their kind. The theatre also contains many original features such as its fire curtain which are in fine working order. – The building also houses a small hall which is used by local groups and whilst the theatre has mainly been used as a function room for parish events since 1988, local theatre groups have continued to use it to stage performances and hold rehearsals. – The theatre has continued to produce talent to this day and many have gone on to be professional actors, directors and musicians. – The building is listed on the Enfield Heritage list.